cryptonaut-in-exile: The Most *Read* Books in the World? I doubt it. 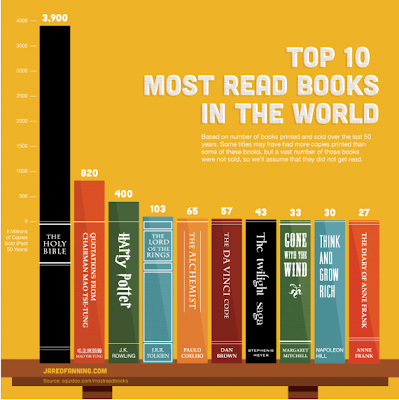 Take #1 on this list and compare it to #3 -- fine, I'll grant the Bible may be the most owned, but I will bet dollars to donuts that hardly anybody bothers to read it except the passages they get read to them. On the other hand, I would be very surprised if the people that start reading the Harry Potter books don't go from cover to cover at least once.